Spin-offs and sequels have become all the rage in the Final Fantasy series these days. Final Fantasy X received a mission-based sequel starring former summoner Yuna along with Rikku and new ally Paine. Likewise, the universe of the landmark Playstation RPG Final Fantasy VII has been revisited several times in movies, PS2 sequels and even PSP prequels. 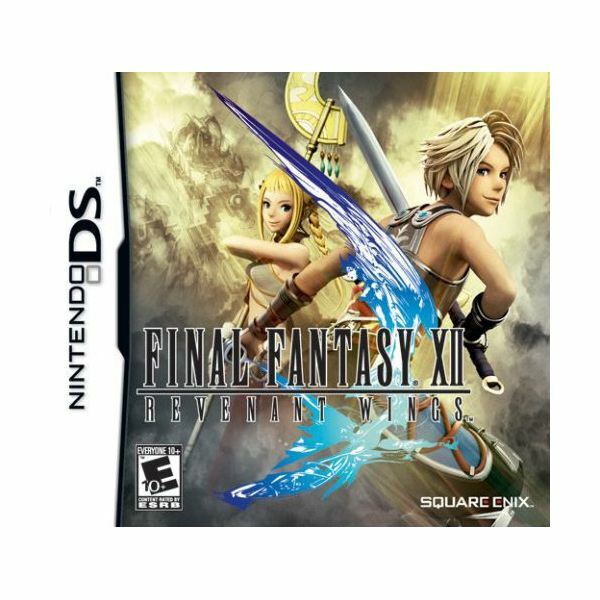 Even the most recently released flagship game in the series, 2006’s Final Fantasy XII for the Playstation 2, received a follow-up title, 2007’s Final Fantasy XII: Revenant Wings for the Nintendo DS. While it is a radical departure from its source material, it is nonetheless a game well worth playing. Once again, Revenant Wings has players assume the role of Vaan, the character through whose eyes the events of the original FF XII were witnessed. This time, however, instead of just being one piece of the puzzle, Vaan is the driving force behind the storyline. He and his girlfriend Penelo are now full-time sky pirates, and as the game opens, they accompany fellow pirates Balthier and Fran in a search for a treasure known as the Cache of Glabados. Afterwards, the duo joins with fellow Rabanastre residents Kytes and Filo, acquire an airship, and wind up in the land of Lemures, where they agree to help defend a race of winged creatures known as the Aegyl protect their homeland. It isn’t too long before other familiar faces show up, including Princess Ashe and Basch, and the whole thing turns into an epic battle against a sinister entity known as the Judge of Wings. It’s solid, albeit somewhat familiar, RPG fare, and while that is a little disappointing considering the heavy tone and political intrigue of its predecessor, it will keep most folks entertained throughout. The original Final Fantasy XII already possessed a few real-time strategy elements in its combat system, but Revenant Wings takes things a step further. It is a full-blown RTS, complete with troop movements and seize points. Joining Vaan, Penelo and the other human characters are battalions of summoned monsters, which are chosen prior to battle and can be brought back at specific summon points on the map, once characters gain control of them. Battles take place automatically, and the returning Gambit System is used to control their actions, though each character is allowed only one at a time in Revenant Wings. When defeated, large summon beasts called Espers can also be brought into battle to attack enemies or heal the party. In addition to battles that advance the story, players can also engage in a number of side-quests or free-battles to level up, gain new summon beasts and discover a variety of secrets. In Japan, this was specifically designed to be a light, easy game for those unfamiliar with RTS concepts. When it came over to America, however, the difficulty was noticeably cranked up, and no doubt about it, this can be an extremely challenging game at times. While Revenant Wings doesn’t boast the spectacular visual effects and 3D character models that some other Square Enix efforts do, it is quite an attractive game and makes good use of 2D sprites and simple yet lush environments. The few cinematic screens that are present are also quite impressive, though I’m sure not everyone will appreciate the more child-like appearance that Final Fantasy Tactics A2 designer Ryoma Ito has given to the FF XII cast. Audio work is stunning as always, and I appreciated hearing several tunes from the original title have been ported over to this sequel. Solid work, as has become expected in Square Enix games. The transition from RPG to RTS may be a little jarring at first, but the more you play Revenant Wings, the more you’ll come to realize that this is undoubtedly a true Final Fantasy game through and through. The likable characters, the entertaining story and the high production values that have become the trademarks of the series are all present here. The game is quite challenging, though in a good way, and when you finally overcome the final boss odds are you will experience the same kind of triumphant rush of adrenaline that I did. The RTS mechanics can be tricky at first, especially if you’re a novice to the genre. Give it time and you will get used to it, though, and believe me, the effort you put into learning this game is well worth it. A collection of reviews for Final Fantasy XII.